First off, thank you to Jennifer from Dimples & Tangles for sharing this product when she cleaned up some silver trays. She’s just awesome, y’all. The hardware in the photo above is what was original to the vintage radio that I just turned into a bar cabinet. I almost spray painted them, but decided first to give Bar Keeper’s Friend a try. 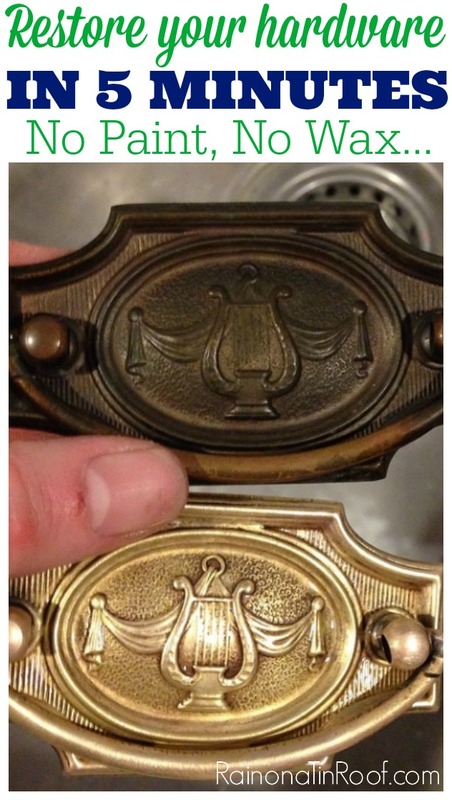 I had only used it to clean real brass before, and I was pretty sure this hardware wasn’t real brass. I wasn’t sure if it would work or not, but it SO did! First, I ran some water over the hardware, then sprinkled the Bar Keeper’s Friend on. Next, I took an old cloth that was a little damp and rubbed it around the hardware. These pieces had some nooks and crannies, so I took an old toothbrush to really get into those. Then, I just rinsed it off and let it dry. The top pull is from the same cabinet, just not cleaned yet. I was totally baffled. And it took less than 5 minutes to clean it up! 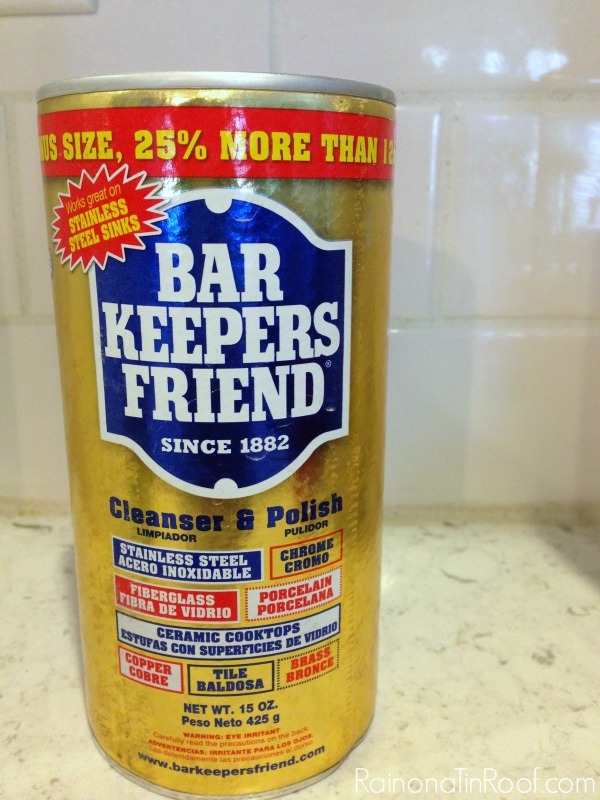 Have you used Bar Keeper’s Friend before to restore hardware or clean anything else? I want to know what else this bad boy will accomplish!! You can see this hardware in all its restored glory on the Vintage Radio turned Bar Cabinet. Also guys, this IS NOT a sponsored post for Bar Keeper’s Friend – I just wanted you to know how easy it can be to restore your hardware – put that spray paint down! 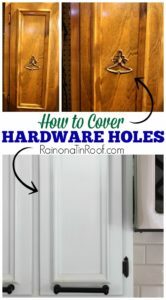 Need to know how to cover old hardware holes? I love BKF. I use it on everything. 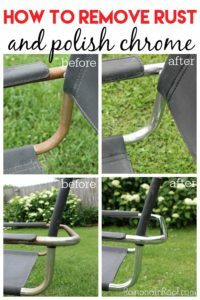 It seriously removes rust from chrome too. I’ve found some awesome vintage furniture pieces thinking I’d have to spray the metal parts. Nope, not with BKF. Just be careful Jenna. I know you are new to the stuff – make sure you wear gloves when using. It does have an acid in it. I forgot to put gloves on one time while I was scrubbing a candelabra and the tips of my fingers were swollen for a few days. It was weird. They were so smooth I couldn’t do anything with my fingers…..
Really – it removed rust off chrome?! That is awesome!!! Ok – had no clue about the wearing gloves part. My fingers didn’t swell or anything, but I also was only using the stuff for five minutes or so since I just had a couple pieces. I will definitely be wearing them next time around! Thanks so much, Rebecca! Ahhhhhhh!!! That is so awesome, Rebecca!! Thank you so much for the tip! They have it at Home Depot (where I got mine), Ace, Wal-Mart, Bed, Bath and Beyond and their website has a whole other list of retailers. I have no idea about the jewelry. Honestly, this stuff is so powerful, I would be a little scared to use it on jewelry. I’m not sure about the guns, dad, but another reader did say it took rust off – I would try it in a small spot first. Use Flitz, its made for guns and removes the rust but not the blueing. Rebecca, Do you suppose this would also remove rust from & restore the shine to chrome on a motorcycle? Is that where you tried BKF on? Thanks. Dale. Love all this great cleaning info! I too love BKF, as I have a small cleaning company I use it a lot! Anyway, the palms of my hands starting getting really irritated (red, itchy, and peeling, yuck) I absolutely have to wear gloves now…My hands now are permanently red! Just be careful and wear those gloves, girl! Oh no, Cathy!!! Yes, I have started to wear gloves now! I have used BKF only on my stainless steel sinks! Had NO idea it would work on hardware. I have several pieces I am going to try it on, including some brass on some table legs. I’ll let u know how it works & if it looks good I’ll try to put a photo on the comment if I can. Or maybe I can Instagram it? Sorry I am old and kinda techno-challenged these days. Thanks for the info! Yes, please let me know, Donna!!! I’ve got to use it on my stainless steel sink – I bet it would do wonders! Please send me a photo – I don’t think you can do it in a comment, but you can email it to me or upload it to Instagram!! Can’t wait to see! I agree with Rebecca about the gloves if you’re going to be using it a lot. It’s pretty strong stuff! I used it in the shower at our old house without gloves and my hands turned red and dried out wickedly, peeling and cracking. So watch out if you’re using a lot of it! Gonna add this to my “Useful Tips” board on Pinterest! Yes, April, I’m thinking gloves are a must for working with it in a longer time frame. You guys are just awesome with all your tips! Thanks! Dude. I’m kicking myself too now! I’ve never even heard of this stuff, so I’m pretty darn excited to try it! Thanks for making my wildest hardware dreams come true! We’ll be kicking ourselves together!! haha!! It is awesome! 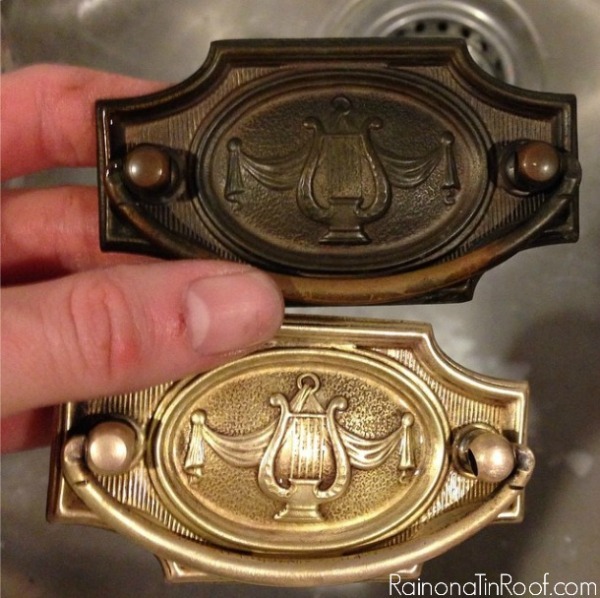 Will it clean Antique Brass Door Fixture? Just yesterday I was, again :), looking at some painted over door hardware that is brass and wondering when, just when, I’d have enough time to spend on this one set. Another set is unpainted and I salivate as I pass it. Then there was this great tip this morning, I’m in Australia, then googled and someone in a capital city here actually stocks it. Outstanding! I’ve ordered, I’ve paid, I’m waiting. Thank you so much for how you share you experience of restoring, using, I’m thrilled. Carol. Yay, Carol!!!! Can’t wait to hear how it works! My mother in law introduced me to BKF earlier this year when me and my husband bought our first house. The house came with the most disgusting stainless steel kitchen sink but BKF removed all the nastiness and made it shine like new. She also uses it to clean her ceramic cook top! It removes almost anything! I definitely agree with gloves though if you’re going to be using it for an extended amount of time! It cleans the cook top, too?! YES! Cannot wait to try it out on mine!! Thanks, Cheyenne! BKF also works great to remove utensil marks from plates and the inside of bowls. I had a set of vintage Pyrex bowls that were in good shape except for the gray silverware marks on the inside. This stuff took off all the marks and didn’t scratch the finish. Just be sure to use a small amount and gently polish just enough to take off the marks. Wow!! That is awesome, Terri! Thanks for sharing – I definitely have some bowls that need a little help! I have used BKF for over 30 yrs, it is just about the best all around cleaner on the market. I don’t think I would try it on a motorcycle, jewelry, or guns. My husband takes care of our guns and motorcycles and I know he would never use it on either one. You can buy it in most grocery stores. Thanks for the info, Patty! I definitely thought it was a no-go on the jewelry. I’ll be sure to let my dad know on the others! Ooh, wish I had read this before I had tried to refinish some hardware for use on my hutch (I refinished it by painting with Annie Sloane’s outrageously expensive chalk paint, the hutch that is). Would have saved me a lot of useless work and time! I will for sure be using this tip. I already love this stuff for my porcelain enamel sink which attracts cookware marks like crazy~now I’m gonna use it for a lot of different things~~woohoo! Awesome, Denise! I didn’t know it could take marks off an enamel sink!! Great to know – thanks! Glass top stoves. Seriously, I recently found out about using this on those glass top stoves (I hate mine, its horrible for trying to can) I wish I’d known this years ago, I could have saved a ton of money on cleaner for the stove. NOTHING I have ever used works better than this for cleaning that stove. I use one of those thin, flat green scrubbers that don’t scratch and Bar Keepers friend. Hear me again, NOTHING works better. Frankly, I liked the hardware better dark, but glad to know this works! Great post. Thanks! I have got to try it on my glass top stove, Jackie!! Someone else told me that it was great for it and I hate cleaning my glass top – such a pain!! Thank you so much for the tip, gal! you can also use it to clean copper. Mix with some vinegar and water and you can clean the inside of the stove. Found that walmart has the cheapest for the larger can. There are occasional coupons too! That is great to know, Deb! Thanks! Morning, I live in South Africa…where could I get the product mentioned? Is it perhaps under a different name? Hi Louise! I am not sure if its under a different name or not in South Africa. Here it is sold at Wal-Mart, Target, Ace Hardware, and places like that. I hope that helps! BKF was the only thing I found that would clean the mineral deposits off my toilet bowl, sinks and shower. I tried a lot of toilet bowl cleaners before I found BKF. Wish I would have known about this 3 days ago!!! Just finished cleaning old brass pulls off an old English chest (2 of them) with Brasso. Took forever. Next ones I will be using this. Thanks for the tip. I have an antique brass rocking horse that is big enough for a child to ride. Over the years – since 1978 when I bought it – I have tried keeping it polished with brasso and then sealing it. Would BKF bring back a bright shine without damaging it? It is all brass. I can’t be 100% sure, Roy, but I’m willing to bet yes. I would try it out in a small inconspicuous area first. Great, Sandy! Hope it works for you as well as it worked for me! I just love BarKeepers Friend. It also takes the scratches off Corning Ware and lots of kinds of plates and bowls. It is great, isn’t it, Teresa?! I didn’t know about it working on Corning Ware – thanks for sharing that tip! I have an old trunk in trying to fix up. The hardware is on I. A way I can’t seems to get off. Can I use bar keepers friend to clean them while still on the trunk? You could Barb, I would just tape off really well around the hardware before using the Barkeepers Friend. 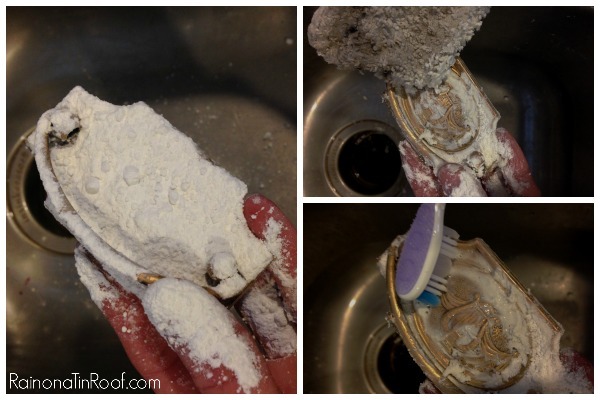 My kitchen designer told me to use BarKeepers Friend to clean my beautiful kitchen sink! Just wet the sink and sprinkle on BarKeeper Friend and rub gently on stains. Rinse throughly and voila your sink is shiny and clean! I was so happy to read your hints for using BF, especially on rust and on brass! Yes! I’ve used BKF on my sink too and it cleans it right up! Love it! The well water in my area can turn white clothes yellow. BKF in the wash eliminated that also cleaned the washing machine. Use this in the shower to clean the glass and the toilet of mineral deposits.in the kitchen stainless steel pots and pans copper too.I have been using BKF for years,as did my grandmother before me. Oh wow!! That is so good to know, Michelle! Wow so glad I stumbled across your website and read this tip. Thank you so much. Also Idk what made me even think to try this (maybe I read it somewhere, who knows lol) but my bathroom door got knocked halfway off the hinges and my kids just kept opening and shutting the door, dragging the door across my linoleum floor so naturally it scratched my floor really good. I was convinced we were going to have to put down new flooring. So thinking I had nothing to lose I sprayed some water on the scratches followed by a light dusting of BKF and took a cloth and started rubbing and girl I couldn’t believe it, the scratches we’re completely gone. Also I’ve used it on scuff marks on my floors and it works just as well removing those. This product is a lifesaver. Hope you have a wonderful Thanksgiving!